So, dating in 2015 can be hard. But it doesn’t have to be. One thing I’ve noticed that didn’t exist when I was younger is the discussion of communication. Communication never had to be “discussed” before. If two people wanted to talk, one of them would pick up the phone, dial the number and talk to the person. Nowadays, one of the first discussions that many new couples have is what acceptable communication is and what kind of communication “counts”. There are 2 main points that come to mind when it comes to communication in relationships: (1) communication has to exist and (2) acceptable forms of communication must be discussed. It sounds basic, but you’d be surprised at the number of people who don’t have regular communication in relationships. This has always baffled me. I’m not saying that you and the person you’re dating have to be on the phone all day every day (that’s just not realistic), but sporadic communication or no communication at all is a deal-breaker. This sounds simple, but there are some women do don’t recognize this as a red flag. If he can go 2 days without talking to you, then calls you on the 3rd day like nothing happened, something is wrong. Some women will make excuses for a man for doing this (he was tired, he was helping his mama), instead of just taking it for what it is (he’s not serious; he’s playing games). If you meet a man and things seem to be going well, then all of a sudden communication becomes inconsistent or stops altogether, then that’s a red flag that you need to pay attention to. And it’s a red flag that means he’s not interested, no matter his excuse. About 4 years ago, I dated a guy for about 4 months. He went MIA for 10 days, with no explanation. He showed up at my front door, in utter shock since I had given him the good ol’ block and delete (jokingly referred to amongst my friends as the #BnD). He was basically offended that I took away his option to contact me, or not contact me, whenever he wanted. That’s not ok! Any man that can go missing for such a period of time is not the man you want. In today’s age of technology people can reach the world via FB, IG, Twitter, Snapchat, Skype, Facetime, Kik, and now Periscope, just to name a few. They can PM, DM, text, tweet, snap, ping, poke, like, share, double-tap, follow, unfollow, and subscribe. You mean to tell me he can’t figure out how to CALL somebody?? We pocket-dial people on accident sometimes! Ladies, this is not an argument to be had, and it is absolutely ridiculous to ponder why a certain man isn’t calling you. Trust me, men are not as dense as they will take credit for being, especially if it allows them to continue running game…but the buck stops with you. Let them do that to someone else. If they can’t or haven’t mastered the basics of communication, then they are not mature enough for you. The quicker you accept it, the better the situation will be. Save yourself the frustration. Move on, friend! You’ll appreciate it in the long run, when the right man comes along who takes pleasure in showing you how much he likes talking to you. Dating can be hard, but the basics should be a no-brainer. The type of communication should also be discussed. Call me “old-fashioned” but I prefer phone calls. 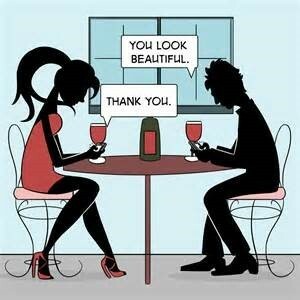 I allow texting for someone I’m interested in only when we are at work or participating in other activities where being on the phone is not convenient (being at the movies, or at my niece’s basketball game where it may be hard to hear, for example). Other than that, if we are not in each other’s presence and want to talk to each other, we should be comfortable enough to dial each other’s numbers and actually speak on the phone. So much so, that when I don’t hear from a potential love interest in this manner, I lose interest. I don’t take them seriously. And if we’re not in each other’s presence, please don’t try to have a serious conversation with me on anything other than the earpiece on the phone. But that’s me. I have a close friend who is now married, and the main form of communication between her and her husband is texting. It wouldn’t work for me, but it works for them. Discuss what works for you and what doesn’t. Since communication has changed so drastically over the years (do we even remember landlines anymore?) it needs to be discussed. You need to ask them about appropriate forms of communication between the two of you. When you ask about their spiritual beliefs, opinion about marriage, or if they want to have children someday (you ARE asking these question, right?!) you should also ask about their preferred form of communication. If theirs does not match yours, then it needs to be discussed and a compromise needs to be reached. Getting this out of the way early can save a lot of stressing later.